With 135 steps, the stair at St Nicholas Park seems tremendous at a first glance: it is a wonder why anyone makes the journey, especially from the bottom to the top of the stair. 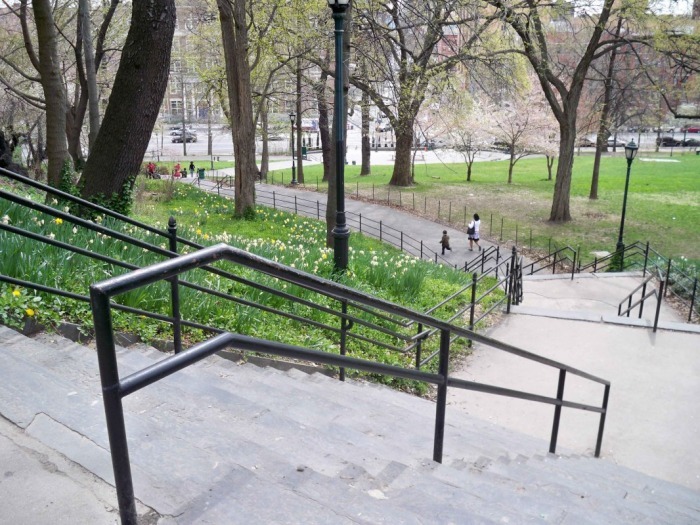 While a hassle for adults, many teenagers willingly and vigorously traverse the stair, as they make their way through the park every morning and afternoon from the subway stop at the bottom of the stair to Philip Randolph High School at the top. It is during these times that the stair is most active, serving teenagers as a place to congregate, as they arrive to school or wait for a ride home. Many of them staying throughout the afternoon, inhabiting the park, enjoying the busy traffic on St. Nicholas Terrace and St. Nicholas Avenue. 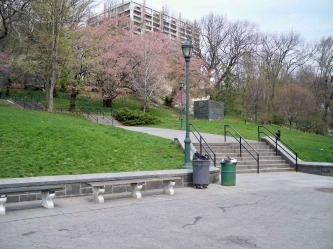 The stair itself resides on one of the few green patches in the grey fabric of the city, St. Nicholas Park. One of the oldest in the city, roots of St. Nicholas Park goes back to the time of the extension of the Old Croton Aqueduct, over a century ago (1885). Nestled between St. Nicholas Terrace and St. Nicholas Avenue and on property intended to be used for the aqueduct, the park covers a long, narrow expanse of land running from West 127th Street to West 141st Street and a-butting the ridge that runs through northern Manhattan. Samuel Parsons Jr., Landscape Architect and Park Commissioner, designed the park landscape; dictating that a "dominant note must be followed with a harmonious treatment, a high hill made higher, a rugged slope more rugged, a deep valley made deeper, thus invariably following nature’s lead." He wisely molded the park around the irregular topography of the site, giving St. Nicholas Park the natural rhythm (incongruous with the grid) seen today. 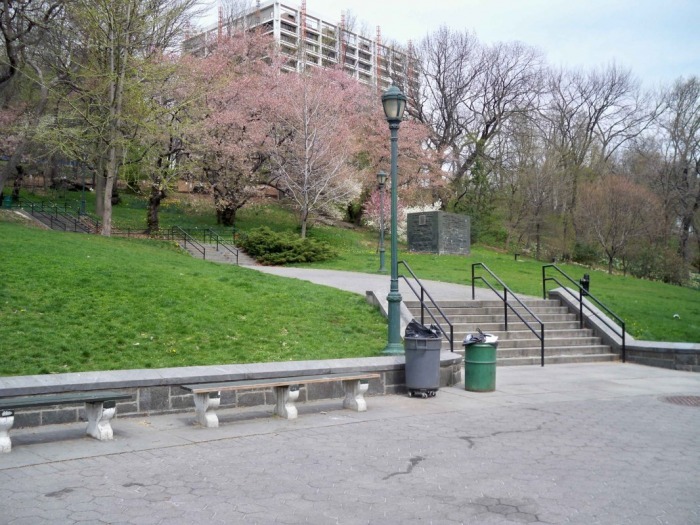 The park maintains landmark status due to its prominent history as "Point of the Rocks," which includes an area that had earlier been utilized by George Washington in the American Revolution (St Nicholas Park, 1-2). 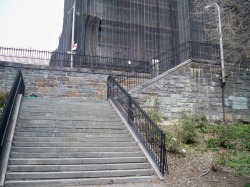 St. Nicholas Park's history also includes a series of extensions and restorations. Over the years, the park's purposes have strictly maintained a recreational aim. In 1931, the park contained a basketball court, swings, and a garden. In 1932, the city opened a subway stop (on the new IND Eighth Avenue Line) at West 135th street and St. Nicholas Avenue, and placed one entry adjacent to the stair. Later, in the 1960s, the Board of Education authorized the commission of the 129th Street Playground. In 1995, the community of Harlem and the City College of New York paired together to clean up the park and make it safer. New playground equipment and basketball courts were added. 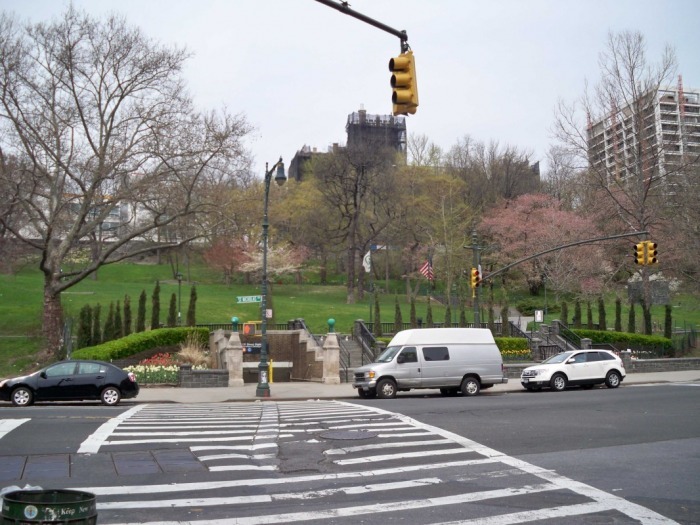 Presently the park is one of New York City's most beautiful spots, a "leafy oasis” containing winding paths through its rocky and green landscape. In 2006 it was chosen as park of the month, and in 2007 a new dog park was constructed. Populated by a growing number of dog runners, the Friends of St Nicholas Park have sponsored numerous events, including the “Coffee Bark.” At this weekly event, dog runners from the neighborhood get a chance to socialize. Still many more improvements are to come, making the park a more inviting place over the next few years (St Nicholas Park, 1-2). The Brilliance of Samuel Parson's vision is illustrated today, even in such a common element as the stair. 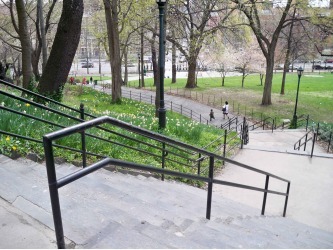 The shape of the stair inconspicuously imitates the rhythm of the park's landscape, trying helplessly to stitch the city back together. Within this winding path of concrete are scattered intermissions, instances that welcome activity, lending itself to teenagers. 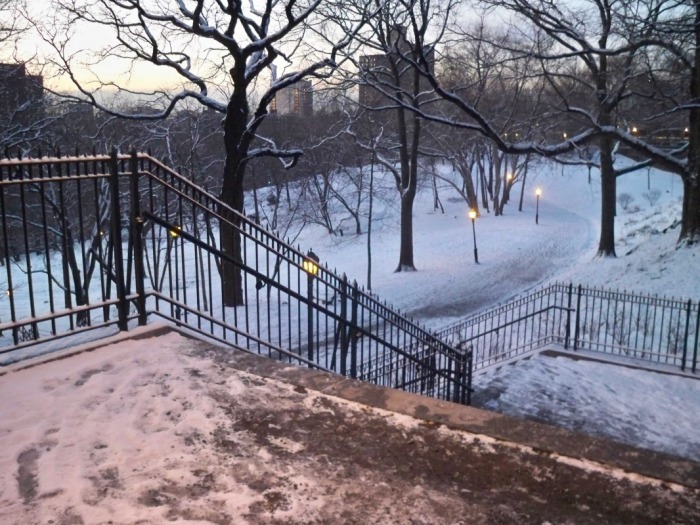 On one instance at the end of the stair: a teenager is at the highest point of the park, and like a sentinel, may watch over anyone and everyone that comes through park. While at the other end, a teenager would be in the middle of a plaza, where every traveling passerby is a spectator, and the teenager an actor. It is these kind of games that teenagers play, manipulating and taking over stair spaces for their own enjoyment, using them to gather and play.